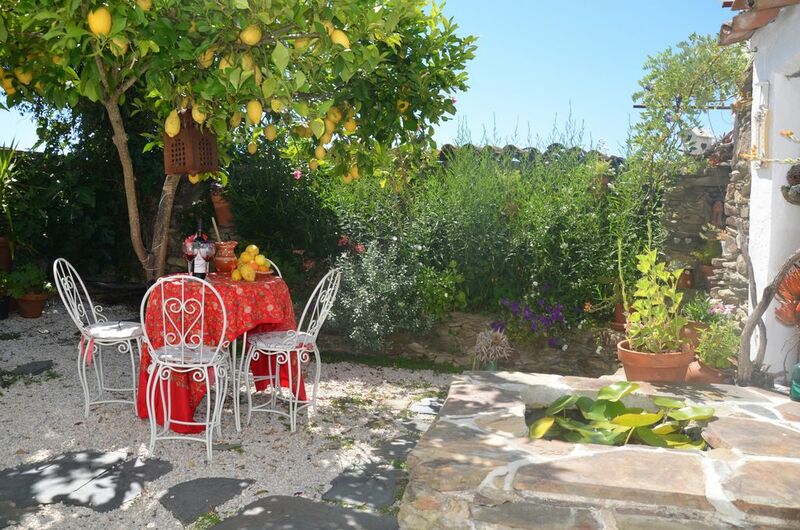 Sunflower Cottage is surrounded by pine, ancient olive and chestnut trees, scrubby shrubs, rosemary and heather, Awake refreshed from the clean, clear, low polluted air and the glorious smells and vivid colours of citrus, jasmine and eucalyptus and which grow in abundance here. Or the sound of birdsong or the pleasant sound of goats bells as they pass by on their way to graze. Life is slow here, a time for downtime and relaxation, a time for reflection and opportunity. If you are looking for total escapism out of the rat race to relax in peace, quiet and tranquility this is the place for you. Enter to find a living area, a cosy woodburner for winter evenings, a sofa which can convert to a sofa bed and a fully equipped galley kitchen. Access to the main bedroom is up a spiral staircase with ensuite bathroom. There are 2 twin beds made up with quality white Egyptian cotton sheets, – imagine waking to those in the morning!